The stirring dramatization of the story of Helen Keller is one of the most successful and warmly-admired plays for the modern stage. Drawing heavily from letters written by Anne Sullivan in 1887, as well as from Helen Keller's autobiography, William Gibson constructed a drama around the events that took place when Helen Keller and her teacher, Anne Sullivan, first met in the 1880s. 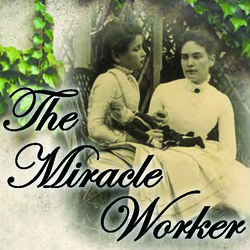 The exchanges that take place in The Miracle Worker are all derived from factual events that Gibson has woven together to construct a fluid, emotionally-potent, depiction of the "miracle" Annie Sullivan was able to work: teaching Helen Keller language. Little Helen, trapped in her secret world, is bitter, violent, spoiled and almost animal-like. Only Annie realizes that there is a mind waiting to be rescued from that dark, tortured silence. Annie's success with Helen comes only after some of the most turbulent, emotion-packed scenes ever presented on the stage.